This was what Patrick spotted from our porch on Friday afternoon. 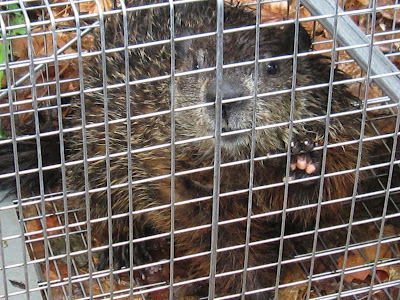 A very fat, wet, somewhat remorseful-looking woodchuck, sitting in our trap. Ha, ha, ha. I haven't talked much about the woodchuck here, because I like this blog to be my happy place. 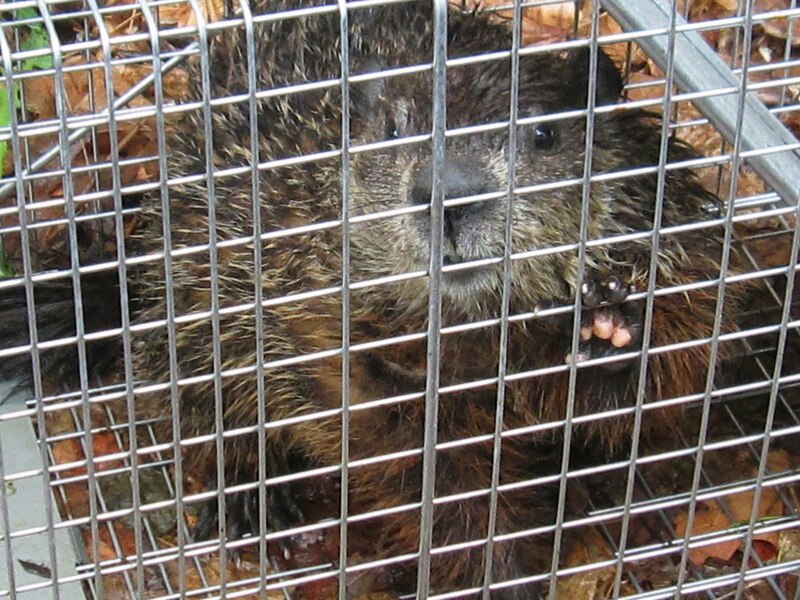 Woodchucks do not make me happy. They eat my garden. They arouse purely murderous thoughts in my mind. Remember last summer's garden? The lush perfection of mid-June? Well, that was before the woodchuck showed up, and quickly mowed the broccoli down to shaggy green stumps. With this creature, this Rodent Antichrist on the loose, I knew it was only a matter of time before I came home from work, made a cup of tea, went out to visit my seedlings, only to behold... a desolate clear-cut where my lettuces and pea plant once stood. I knew time was short. I set the trap, and I waited. Nothing. Nothing, for two whole weeks. Everything I've read online says that these guys are dopes, suckers for anything appealing to their voracious gut. Last Thursday evening, I replaced a shriveled, soggy carrot with a crisp fresh one. And this was too much to resist for Patrick's friend and my arch-enemy. The trap's metal doors slammed shut, and the varmint's broccoli-thieving days were over. We boxed him up and happily escorted him across the river, to a water tower surrounded by frowsy fields and vinyl-sided McMansions. If he eats those peoples' gardens, he will likely drive them to a comparable blind rage. But they'll simply have to do what I did: wise up, and get a trap. Oh, he's so cute. I'm quite sure he is very happy in his new home. P.S. Did he make a fuss at you when you moved him around? and i'm not sure mcmansions have gardens. he'll starve! Oh to be the proverbial fly on the wall when chuckie wreaks havoc on the coifed gardens of McMansionville! If you catch another I have a place to place him! Bwahahahahahahahaha!!!!! Wow! That's pretty sad. The best way to protect your garden is a chicken wire fence. Studies have been done that show that as long as the habitat is available other woodchucks will move in. Also, trapping can leave behind babies which will starve to death. Becky-- my fingers are firmly crossed that there won't be another one. But if there is, I may take you up on that. Oh my gosh. I can understand why you don't like them, but that is one cute critter!